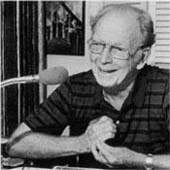 The first to broadcast baseball games in New York City on the radio and the very first television broadcaster, Red Barber joined Mel Allen as the first Hall of Fame inductees into the Broadcasters Wing in 1978. Barber broadcast for the Brooklyn Dodgers from 1939-53 and then for the Yankees until fired in 1966. Know for his folksy expressions, his most famous is "Sittin' in the catbird seat" to indicate when a team was doing exceptionally well.